During the period, the shipping firm handled 62.93 million tons of cargo at domestic ports and transported another 18.66 million, equivalent to 64.1% and 86.9% of the year plan, respectively. Tra fish export value is expected to exceed US$2 billion this year, higher than the industry’s target, due to the US-China trade war, according to experts. Mechanical engineering is considered the backbone of the national economy. However, after many years of development, the industry can only satisfy 32 percent of domestic demand. The government’s bold actions in easing business conditions and reforming red tape have helped improve the country’s business climate significantly in the past year, making the country become an attractive trade and investment destination. Vietnam’s recent exchange rate fluctuation will not carry into the last quarter thanks to strong government reserves, experts say. Authorities in Vietnam seized 13 rhinoceros horns and related items from South Africa on Friday, just two weeks after the seizure of a ton of illegal wildlife products, state media said. Aloe vera farming has helped farmers in the south-central province of Ninh Thuan adapt to climate change and earn steady incomes since thanks to high demand for the plant to make food, cosmetics and herbal remedies. AC ENERGY, Inc., along with its Vietnamese partner, has signed construction and financing contracts for the development of solar plants in Vietnam valued at an estimated $83 million, the Ayala-led company said during the weekend. The domestic real estate market in the fourth quarter of this year is forecast to see the strongest increase in transactions in the year, higher than the transaction volume in the same period of 2017. A group of environmental NGOs has called on the European Union to postpone the signing of a trade deal on tropical timber with Vietnam until Vietnam declares a moratorium on illegal timber import from Cambodia’s natural forests. Three infrastructure projects between a Vietnamese and an Indonesian enterprise with total investment to the tune of US$300 million have been signed in the presence of Vietnamese Prime Minister Nguyen Xuan Phuc. Call it Vollywood? Vietnam’s movie scene is growing quickly, with an explosion of theaters across the country, more filmmakers entering the market, and more global attention from the 2017 blockbuster “Kong,” which was set and filmed here. Japan’s Mitsubishi UFJ Financial Group (MUFG), the largest foreign shareholder in Vietnam JSC Bank for Industry and Trade (Vietinbank), is reportedly looking to increase its ownership from the current 19.7 per cent to 50 per cent in the Vietnamese lender, should the government relax the overseas investment cap in banking. HCM City’s industrial sectors have seen good growth due to the city’s efforts in creating a better environment for investment and businesses, the city’s Department of Industry and Trade said on October 11. River and sea ports in the Mekong Delta system of Group 6 ports handle a huge volume of goods, but 70 percent amount of goods in the region are still carried by road to Ho Chi Minh City. Farmers in Tien Giang province, the country’s largest fruit producer, have planted 1,000ha of new fruit plants so far this year, according to the provincial Department of Agriculture and Rural Development. The project aims to enhance the position of Ha Long city and Quang Ninh province in the international area. Up to 99 enterprises and 100 entrepreneurs in Ho Chi Minh City were awarded for their outstanding achievements at a ceremony held in the city on October 13. The Vietnam Ministry of Health and the Ministry of Agriculture and Rural Development in coordination with Lao Cai People’s Committee and international organizations co-organized the conference “Rabies prevention and control in key provinces” and the World Rabies Day response meeting on “Rabies, sharing the message. 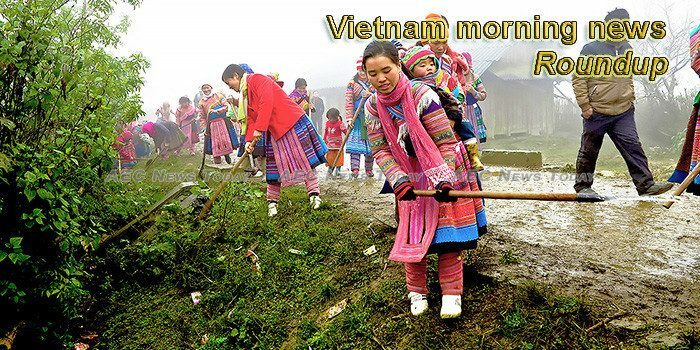 Saving lives” in Lao Cai city, Lao Cai province. Internet users in Vietnam and around the world may experience network connection failures within next 48 hours as the main domain servers and related infrastructure controlling the web will be powered down for some time. On the occasion celebrating three decades of foreign direct investment (FDI) attraction in Vietnam, many companies and organisations, including several foreign-invested enterprises who have been honoured by the Vietnamese government with prestigious awards for their outstanding FDI contributions and achievements, talked with VIR about their view on Vietnam’s foreign investment journey, what changes they would like to see, and what upcoming trends they anticipate. By making a rare second trip this year to Vietnam, Defense Secretary Jim Mattis is signaling how intensively the Trump administration is trying to counter China’s military assertiveness by cozying up to smaller nations in the region that share American wariness about Chinese intentions. Cambodia has agreed to resume a search effort with the United States for the remains of Americans killed in the Vietnam War, the Foreign Ministry said Sunday, after suspending the program a year ago as tension rose between the two countries.